The Laserworld ES-400RGB from the Evolution Series is the perfect choice for first time users wanting colourful beams with the option to control the laser through DMX and create their own show. All functions can be controlled with a DMX512 controller, but for easier operation the automatic sound-to-light function controls the laser so you don’t have to care about programming the laser directly. We have even incorporated the option of switching between beam or animation effects from the flick of a dip switch to suit your event. The powerful laser beam makes these units perfect for small to medium sized rooms. You can project wave effects, tunnels, flat beams, animations and many more from the extensive programming and even control the size of the images with the new zoom feature. Due to our high end laser projector knowledge we have produced a budget price laser with beautiful smooth scanning, a great white balanced projection and an array of solid vivid colours. Build quality as always is to high standards due to our solid metal construction and protective lens for the scanners with high quality control from our Swiss engineers in our manufacturing process. An incredible RGB color system producing white at a really low price with DMX and fast 30kkps galvos really means that seeing is believing! 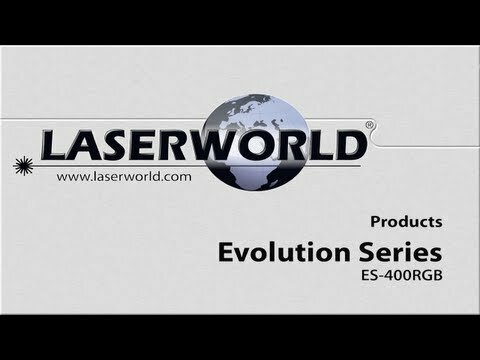 Considering purchasing the Laserworld ES-400RGB? Have questions? Ask people who've recently bought one. Do you own the Laserworld ES-400RGB? Why not write a review based on your experience with it. Impressive laser with the right amount of power needed for the venue size. Looks good and well worth the money. 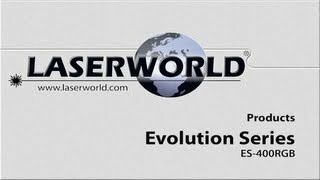 Seen a video for Laserworld ES-400RGB online or have you own video? Check out Laserworld ES-400RGB on DJkit.com!